Rev. Rowan Redbeard wrote: Explained to a co-worker today when they offered me a Christmas Chocolate coin...though I still prefer "Happy Bah Humbug!" Always take their food. It's one of the few ways our religions are similar. I keep saying that you'll only catch me in a church for a wedding, a funeral or around Holiday when the lutherans have those great Scandanavian buffets! When did I say I turned it down? Looks like Milo is getting cataracts in that pix. You're gonna blind him Roy! 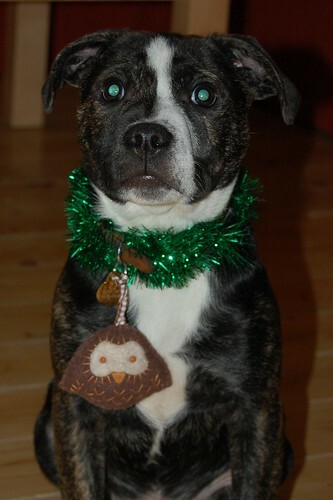 Wonder if Milo ate the garland? Apparently dogs and cats have a semi-reflective layer on the back of their eyes. The reason humans have red-eye is light reflecting from the blood vessels in the back of the eye, dogs and cats actually reflect back more of the light (apparently). Still not Monkey here yet. It's Monkey here now! Happy Monkey all! May His Noodliness touch you in all the right places! May he bestow upon you pasta and grog in abundance! Yarrrgh! Under six hours of Monkey left here. Mind you, that means less time until my 30th wedding anniversary tomorrow! daftbeaker wrote: Apparently dogs and cats have a semi-reflective layer on the back of their eyes. The reason humans have red-eye is light reflecting from the blood vessels in the back of the eye, dogs and cats actually reflect back more of the light (apparently). Unless my Biology training fails me, i believe it's called the tapetum lucidium. Happy Monkey to all my brethren! only 2 hours and 45 minuets left of holiday. Note: Yes thats me. I'm a bit of a zombie... :] yay photoshop. ME: "I'm wet and indecent." blackfire2013 wrote: Happy Monkey to all my brethren! only 2 hours and 45 minuets left of holiday. Monkey ended nearly fourteen hours ago here! OH WELL! It sounds like most of us had a good Holiday/Monkey anyway! I did, despite a rather evil hangover. My daughter made damson gin, and it's so disgusting that I only sipped at it and stayed sober. Didn't want to offend her by drinking something else. It's funny waking up on Monkey+1 without a hangover. Tigger_the_Wing wrote: Under six hours of Monkey left here.